The Bayfield model has 2 Beds and 2 Baths. 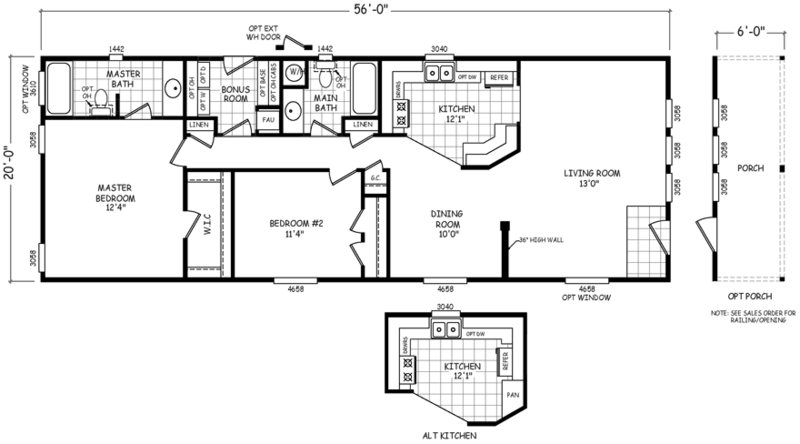 This 1120 square foot Double Wide home is available for delivery in Arizona, California, Nevada, New Mexico, Colorado, Utah. There is something special and unique about the way each room is configured in the Bayfield model. The 36” high wall that separates the living room from the dining area creates an intimate setting for gatherings. The optional 20-foot covered porch would be the perfect space to enjoy a morning sunrise or early evening barbeque. An alternate kitchen layout is also available. If pictures are shown, they may depict upgrades and options that are not included within the base price of the home. Ask your housing consultant for details about the other great features that come standard on the Bayfield manufactured home.